In my day to day life I'm somewhat of a tea-addict, but nothing makes me more excited for a dessert than seeing "coffee" in the description. No matter how late it is, no matter how full I am, I will always order that dessert, and I'll devour every last crumb. 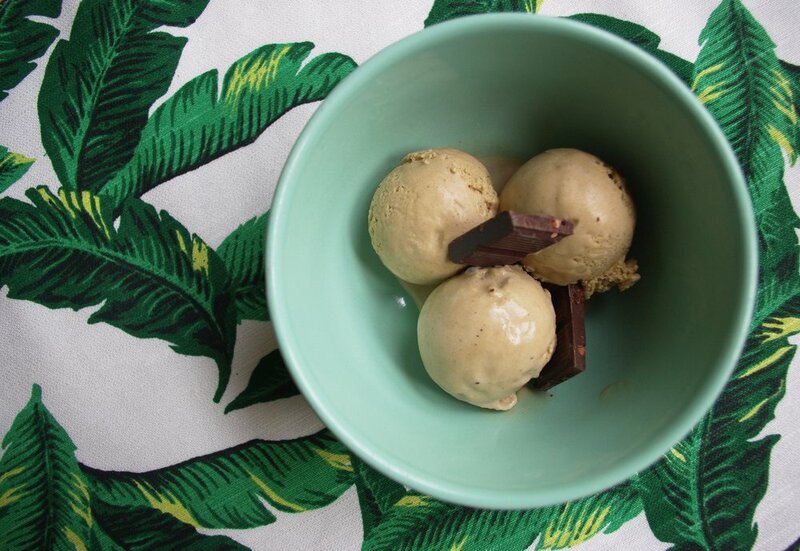 I've done many posts with quick/simple desserts, so you might assume this recipe came from the desire for an easier method of making coffee ice cream. Unfortunately, that's completely untrue - I just wanted to try making something with our leftover, filtered-out grinds from cold brew coffee (and it worked!). Ian kept making cold brew, there kept being leftover grounds, and I kept making ice cream. But this recipe, unlike so many I've shared in the past, really isn't simple. It's not particularly difficult technique-wise (in the way that making a soufflé is), but it is time consuming. This method eliminates time spent over the stove, steeping ingredients in hot milk - but as with any custard ice cream, it's still a multi-day process. In my opinion though, it's well worth it. Because the process takes a while, my two biggest recommendations are to make sure your milk and cream are well within date, and to place the bowl of your ice cream maker in the freezer as early as possible - give it two days minimum to freeze, especially if you've got a full freezer. Otherwise you may get half way through churning and realize the ice cream base has reverted to a chilled soup (speaking from very unfortunate experience here!). The texture of your ice cream is determined by how quickly it's frozen (the longer it takes to freeze, the larger the ice crystals in the mixture are) so an ultra-cold freezer bowl is absolutely essential for creamy, smooth ice cream. * Again, put your ice cream maker's bowl in the freezer as early as possible; preferably, the day you make your cold brew. ** For this recipe, you NEED to use whole milk and cream, separately. Do not use skim milk, do not go out and just buy a quart of half and half. *** If you don't want plain ice cream, you can fold/swirl in any toppings, sauces, or add-ins you'd like. Incorporate them after churning, right before the ice cream goes in the freezer. Keep in mind any additions will harden a lot when frozen (surprise!) and the texture may change. I added chocolate to half of my ice cream, so I used a softer chocolate (Dove) and chopped it in to very small pieces. 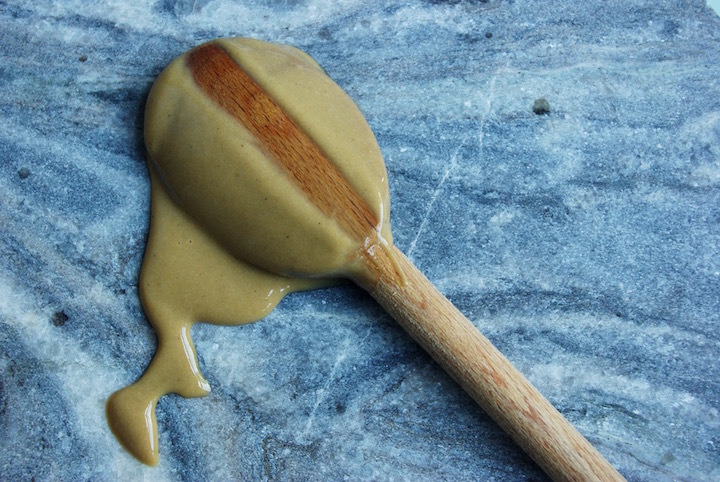 You can also try coating your add-ins with a small amount of coconut oil. **** If you have access to unhomogenized milk, definitely buy that! This should surprise no one, but higher quality ingredients always result in a better end product. Also, if you're looking at the pictures in this post wondering why my milk looks all lumpy, this is why - it's unhomogenized and so the cream stays solid, instead of being suspended in the milk. 1. GRIND your coffee beans on the coarse setting (if they're not already ground). 2. MEASURE two quarts of water and pour it in to your pitcher or container. Make a line with sharpie or tape so you know where the two-quart line is. Pour your water out, add your grinds to the container, and refill the container with water until it hits the two-quart mark. You'll likely use slightly less than the two quarts you started with. 3. STEEP your cold brew for at least 24 hours. 4. STRAIN your cold brew coffee the next day, reserving the grinds. You can use a coffee filter, or line a colander with multiple layers of cheese cloth. Cold brew coffee should be kept refrigerated in an air-tight container, and enjoyed at your leisure. 5. LINE two small bowls with three layers of cheese cloth each. 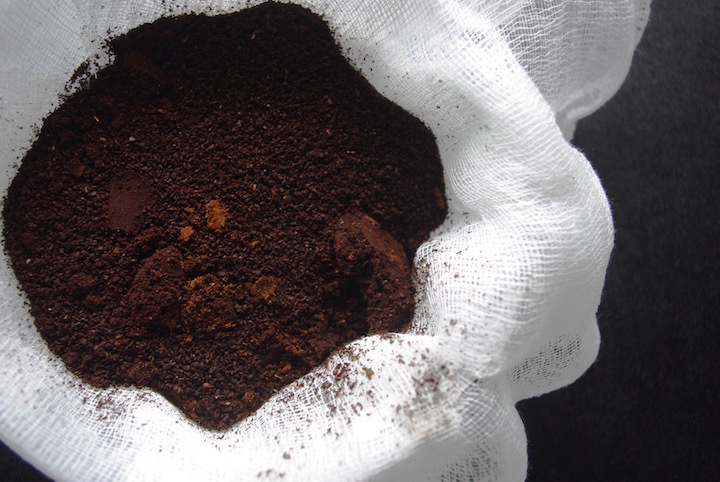 Divide the coffee grounds between the two bowls, and tie them up in to little sachets. I typically just cut a strip of cheesecloth to tie up the bundles of coffee grounds, but twine or any other food-safe type string would work too. 6. MEASURE your milk and cream into separate containers. Drop a sachet of coffee grounds in to each, and poke it down so that it's submerged in the liquid. Cover and refrigerate for a minimum of 24 hours. 7. REMOVE your sachet of coffee grounds from the milk (you can add it to the cream for more steeping, if desired). Pour the steeped milk in to a heavy-bottomed sauce pan, adding half your sugar; whisk to combine. 8. SEPARATE your eggs, placing the yolks in a large, heat-proof bowl. Keep the rest of your sugar to the side, but do not just dump the sugar in with your yolks and let it sit while heating the milk (this will "burn" the yolks). 9. HEAT your milk and sugar over medium-low, stirring occasionally. You're aiming for the milk to reach just below a simmer, you don't want a full boil. When the milk has become very warm, but not scalding hot, add the sugar to your eggs and begin whisking. 10. 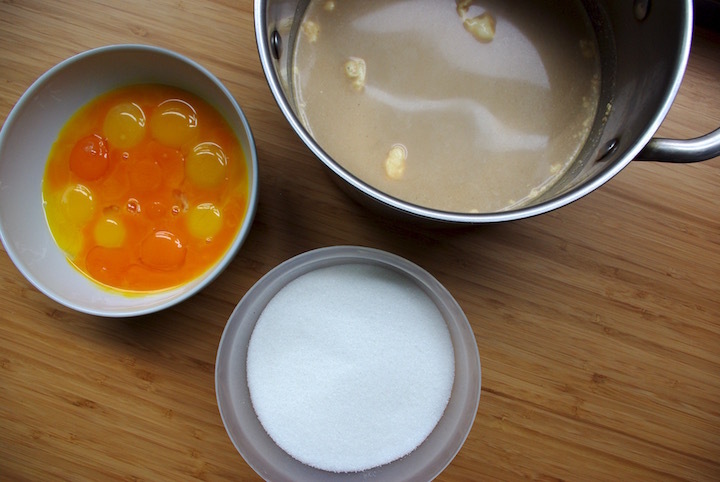 WHISK your sugar and yolks continuously as the milk heats on the stove. The yolks will begin to thicken and lighten in colour (blanchir), but do not stop whisking them until you see the milk start to bubble at the edges of the pan. When the milk as almost reached a simmer, turn off the heat. 11. TEMPER your milk and eggs. Pour your milk in to the eggs in very small increments, whisking the eggs continuously. This will slowly bring the egg mixture up to temperature, and by using small additions of the hot liquid while constantly stirring the eggs, you should avoid the eggs scrambling in the hot liquid. Once the milk and eggs are fully incorporated, pour the whole mixture back in to the pot. 13. STIR the custard constantly as it cooks, and again, do not let it boil. You'll know the custard is done cooking when it's thick enough for you to draw a line on the back of your spoon, and the line holds without dripping down. 14. FILL a large bowl with ice and a small amount of water. Pour your thickened custard into a slightly smaller bowl, and set it over the ice bath. Stir the custard continuously (keep using your wooden spoon) until the mixture has cooled completely. Pour in to an air-tight container, and refrigerate for at least 8 hours, but no more than 24. 15. REMOVE your ice cream base and the cream from the fridge. Remove the coffee ground sachets from your cream, and pour the cream into the custard base. Stir to combine completely. 16. PLACE your frozen ice cream bowl in your machine, and pour the custard and cream mixture in the frozen bowl. Churn immediately! 17. CHURN your ice cream until it's reached the consistency of soft-serve or frozen yogurt. If you take it all the way to a proper ice cream texture while it's churning, you'll essentially make butter instead of ice cream and it will not be pleasant. 18. POUR your churned ice cream into an air-tight container. If you're adding anything to your ice cream, now is the time to mix it in (as quickly as possible)! 19. PRESS a layer of plastic wrap on top of the ice cream, so that the entire mixture is covered, then put the lid of your container on. The plastic wrap keeps your base out of contact with air, which helps prevent freezer-burn, keeping the mixture smooth and creamy while it continues to solidify. 20. PLACE your covered and sealed ice cream in the freezer, and let it chill for another 24 hours.